Sudarshan Patnaik’s tribute in sand to a rocky leader. Will the legacy of rock crumble like sand? THE DEATH AND SUBSEQUENT final rites of DMK patriarch M.Karunanidhi (MK) at the age of 94, may herald a new turn in the Dravidian brand of politics that prevailed in Tamil Nadu state of India for the last five decades. 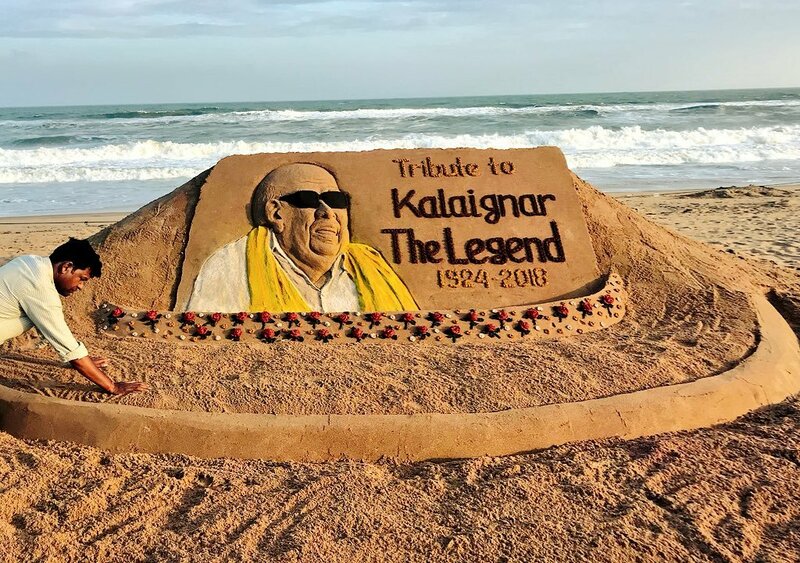 An ugly drama was touched off by the rival ADMK-controlled government declining permission to bury him on Chennai’s Marina beach. The High Court reversing that order put the focus again on a topic I dealt with many times: political differences should not mean personal enmity. MK’s body was laid to rest today, Aug. 8, near the tomb of C. Annadurai, the first Dravidian CM and leader of DK Dravida Kazagam, which MK split to form the Dravida Munnetra Kazagam. 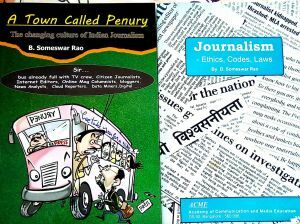 It too was split by MG Ramachandran to form Anna DMK. It is significant almost all the leaders of the three Dravidian parties belong to the tinsel world of films, as actors or writers. It seems more amoebic divisions of Dravidian parties may also be led by film superstars, with Kamalahasan and Rajanikant vying to fill the vaccume left by the death of MK and of ‘Amma’ — Jayalalithaa who died just months earlier. The epitaph written for himself by MK in Tamil — “Oivu edukamal uzhaithavan, idho oivu eduthu kondu irukiran” (translated as “One who toiled without rest takes eternal rest here” — finally found its place on his grave. Will the departure of the two rivals of the Dravidian parties mark the end of politics of hatred for the Aryan North India and for the allegedly-oppressive Brahmin caste? Dravidianism’s other main plank has been Tamil sub-nationalism, which too fell by the way with MK’s Telugu MGR’s Malayalee and Jaya’s Kannada origins and the fact that Rajanikant, the main contender, is a Maratha from Bangalore. The movement, which aroused blind and frenzied following with lives lost every time a leader died — be it Anna, Amma or now MK — has only hatred for Hindi and North left as main goal This will not last long as many South Indians – once clubbed by North as ‘Madrasi’ – speak excellent Hindi and southern youth are lured by jobs to other states. And when a ‘foreign’ English can be adopted as our own, why not Hindi?